Older: AJ Croce Newer: SXSW—My ears are still ringing! Theodore Roosevelt, Frank Lloyd Wright …Bob Dylan? It’s another first for singer-songwriter Bob Dylan, who will become the first rock and roll artist inducted into the American Academy of Arts and Letters. 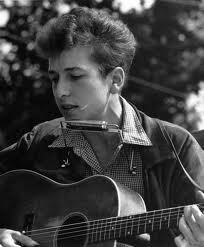 Previously, Dylan was the first rock star to earn a nomination from the National Book Critics Circle for his memoir “Chronicles: Volume One,” and, in 2008, he became the first rocker to receive a Pulitzer Prize. He was inducted into the Rock and Roll Hall of Fame in 1988, and he’s been awarded the Presidential Medal of Freedom and National Medal of Arts. Could a Nobel Peace Prize be far off? Dylan, 71, will join an elite group of writers, artists, composers and architects to be members in the 105-year-old Academy. The roster ranges from literary giants Henry James and Carl Sandburg to painters Jasper Johns and John Singer Sargent. Composers Duke Ellington and Charles Ives were members. The Academy couldn’t decide whether to elect Dylan to the composer or music category, so they compromised and made him an Honorary Member. The announcement was made on March 12. A master storyteller, lyricist and performer like his own folk hero Woody Guthrie, Dylan was at the forefront of the folk revival in the early-’60s. The Academy’s Executive Director Virginia Dajani said the diversity of his work and his iconic place in American culture made him the perfect candidate. “Bob Dylan is a multi-talented artist whose work so thoroughly crosses several disciplines that it defies categorization,” explained Dajani.